There is no mention of Jean Booker on the worthless Dayton Public Schools website. Or of her passing. Forgetting those who came before, and what they did is a cardinal sin. It should not be my job to let the community know that a person who did as much for education in Dayton has passed- that job used to be done by the newspaper, but, well, calling it either “news” or a “paper” now is almost quaint. I saw the one line obit in the paper last week. I, knew right away that a giant in DPS history had left the proverbial building. I waited. Nothing in the paper, nothing on the DPS site. Shameful. I remember Ms. Booker as a school board member. Others remember her for her years as a teacher and administrator. I’m not qualified to write her obit- but I did find a few things online via Facebook that should tell you more than enough about her character and commitment to education in our community. “BOOKER, Jean Daly Age 91-passed away on Saturday, March 3, 2018 at Hospice of Dayton.” is not enough. That services will be arranged in the future is not important. What is important is that she knew education. 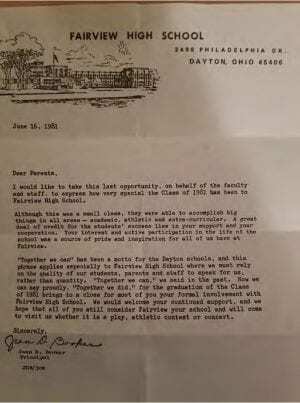 Read this letter to graduates that she wrote back in 1981 as principal of Fairview HS. Together, Jean, we did. Thank you for your public service. I would appreciate anyone sharing Jean Booker stories in the comments. 91, passed away quietly March 3, 2018 at Hospice of Dayton. She was born in Dayton October 31, 1926 to the late Nellie (Williams) and Clemence A.
Daly. One brother, Robert, preceded her in death. Survived by her loving son, Robert, of Indianapolis, devoted friend and loving companion, Geraldine (Gerry) Thompson, special friends Anna Robinson of Indianapolis, Kevin Furlow of Dayton and countless friends, including hundreds of her loving students. Jean was a graduate of Roosevelt High School (1944), Oberlin College (1948) and received her Master of Arts Degree from Miami University. Her career began at Edison and Grace A. Green, teaching elementary physical education, and in 1950 Jean moved to Roosevelt High School. Her years at Roosevelt were as a teacher (1950 – 1961), counselor (1961- 1963) and assistant principal (1963-1968). She then served at Fairview High School as assistant principal, acting principal and as appointed principal. With the closing of Fairview, Jean moved to Meadowdale, serving as principal until her retirement in 1985. Jean was a member of the Dayton Board of Education from 1988 to 1999 and served as its President for 3 years. Her many community awards and involvement include: Dayton Ten Top Women 1963, American Youth Foundation Trustee, and Wesley Center Steering Committee. Environmental concerns were paramount in Jean’s life; she enjoyed the beauty of nature. Watching wild birds in her back yard inspired her. 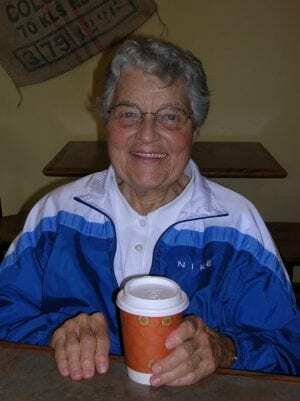 Other experiences enriched her life, including traveling, hiking, walking at Englewood Dam, downhill skiing in her late 60’s and Grand Canyon white water rafting at 78. She was an active member and Elder of College Hill Presbyterian Church and sang in the church choir. Jean was a long-time supporter of the American Youth Foundation and afforded many students and College Hill youth the opportunity to attend its summer leadership conferences. Jean began her own 35-year AYF career as a Miniwanca camper in 1943. She served as a board member for many years until her retirement in 2010. At her retirement the AYF director summed up Jean’s years as “a guiding light to young people and one who was always concerned that the program challenge campers to ‘aspire nobly, adventure daringly, and serve humbly’.” Jean Daly Booker was a Christian servant, an advocate for justice and a blessing to us all. Jean, applying always her faith to human needs, donated her body to The Boonshoft School of Medicine, Wright State University. A Celebration of Life service will be Saturday, April 7, 2018, 2:00 p.m. at Shiloh Church, (5300 Philadelphia Drive, Dayton) Pastor Darryll Young, officiating. Jean Booker was the principal at Fairview High School when I did my student teaching there in the late 70’s. She was well loved and ran a great building. I remember hearing stories about how she went swimming every morning before arriving at school. Her Assistant Principal at the time was big Lou Galiardi who had also since passed away. I learned a lot from them and have always remembered their kindness towards me. Rest In Peace Ms. Booker. Post updated with obit from paper- a month later.